9 Ready to Choose the Best Women’s Watches? Wristwatches have only been around for about 100 years. In the early 20th century, newspapers marveled at the new “bracelet clock” trend. But within a matter of years, watches became a go-to accessory that was both stylish and practical. Today, as everyone carries a smartphone in their pocket or purse, the watch might seem obsolete. But in fact, they’re just as important as ever before. Women’s watches, in particular, make a timeless fashion statement. They also allow for a way to keep an eye on the time while staying “unplugged” from the phone. Wondering which luxury watch to give a special woman in your life? These hot trends in watches for women can’t go wrong. Read on to simplify watch shopping for any woman (including yourself!). Rose gold exploded on the jewelry scene a few years ago. However, it seems to have only grown in popularity since then. It’s not so much a fad as a long-lasting, timeless trend. Women love this metal because it’s classic and goes well with everything, yet shows a bit more personality than your standard silver or gold. It plays well with other metals, so you won’t have to worry about matching all your jewelry. And it functions as a neutral color to pair with any outfit you choose. You can find any watch style in the rose gold color, so take your pick, from bold to delicate. This is the perfect watch trend for a woman who strikes the perfect balance between trendy and classic. Shopping for a woman who prefers a bolder look? Then consider an oversized, yet still feminine, watch design. These watches tend to sit close to the wrist, with a flat shape but a large face and thick band. They’re statement-making, but not bulky. 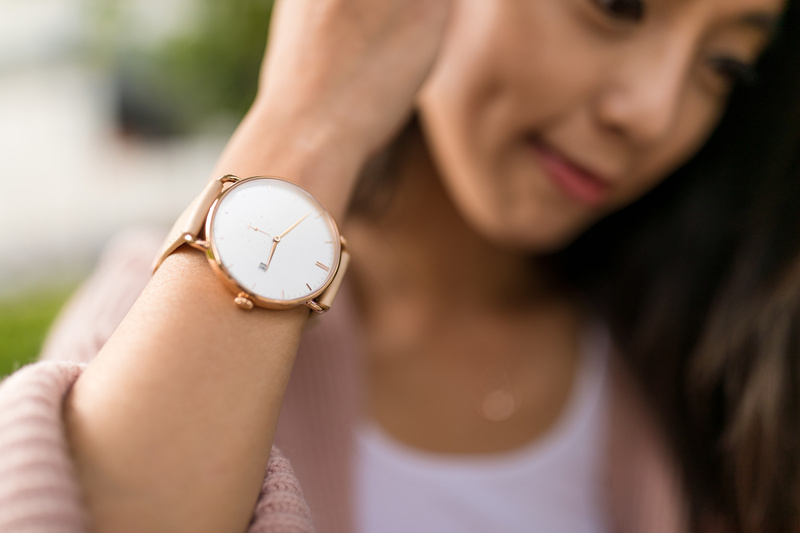 Even though some trend reports over the last few years have suggested women’s watches are getting smaller again, it looks like the oversized watch is here to stay (and slay). This is a great watch trend for the ultra-feminine fashionista in your life. It’s stylish, girly, and bold all at once. Daring women’s fashion has long involved unisex trends. For decades, women have made statements with borrowed-from-the-boys looks (if not literally borrowing clothes and accessories from their boyfriends). Unisex women’s watches take their rightful place among the boyfriend jeans and YSL women’s suits of the world. They’re a great way to dip a toe in this bold trend. But they also pair nicely with a full-on “unisex” fashion look, such as an oversized button-down and boyish slacks. If you’re shopping for someone who likes to push boundaries with tons of confidence, try a unisex watch. They tend to be oversized, but bulkier than the feminine oversized trend. Look for big, bold faces and thick bands in materials like metal or leather. You can find oversized ladies automatic watches, or go straight to the men’s watch section to nail this trend. A nice watch with a leather band will never go out of style. From dainty to oversized, you can find leather watches in all kinds of different styles. In addition to choosing the style, you also get to choose from a wide variety of leather colors for these watches. Black or brown offer a classic, professional look. However, you can make the trend more stylish with a neutral shade of pink or taupe. You can also find leather in any bright, bold color you want for a watch that will pair with specific outfits. White leather also makes a chic statement, though it’s harder to keep clean. A white leather watch is great for special-occasion wear: it’s like the fine jewelry of the watch world. A casual striped watchband looks sleek and pairs perfectly with the athleisure trends that are so hot right now. From designer to inexpensive, you can find a striped watch style at any price point. Look for neutral color schemes involving shades like red, olive, or taupe, so they’ll be easy to pair with different looks. You can also find fast-fashion watches that have interchangeable bands, so you’re not committed to a single colorway all the time. This is a great look for the woman who likes to switch things up as she pleases. For the woman who actually goes to the gym every day, a sporty fitness watch makes the perfect gift. From fitness trackers to classic waterproof watch styles, you can choose from a wide range of looks in the “sporty” category. This might not be the fanciest going-out watch, but it’s just right for those girls who live in leggings and aren’t afraid to break a sweat. There are even workout-specific designs, such as running watches and fitness watches. Metal watchbands are almost as timeless as leather. However, if you want the trendy option, look for a watchband made of a delicate, feminine metal mesh. These bands usually come in gold, silver, rose gold, and black. They suit both small and oversized watch faces well, since they’re not big and overpowering. Metal mesh has a sleek look and it’s lightweight, so it’s comfortable for all-day wear. Minimalism has dominated fashion for much of the 2010s, seemingly a reaction to the decadence of the early 2000s. The trend was reflected in jewelry, from delicate chain necklaces to stripped-down watches. These watches tend to sport unadorned faces and bands. They’re often monochrome in color, so the face, band, and hardware all match. This simple look can actually make a big statement if you choose a trendy color like rose gold or black. Ready to Choose the Best Women’s Watches? With so many trendy women’s watches to choose from, it’s hard to pick just one. But you don’t have to! Many women love having a small but complete “watch wardrobe” so they can match looks from casual to upscale with the right watch. Don’t stop at the watch, though. Looking for more stylish gift ideas? Check out the clothing trends started by top hip-hop artists here!